This cutest little kitty can be always with you, just hang it on a silver chain or a neck cord and wear it on your neck. This small kitten is made of sterling silver and Baltic amber. It is perfect for anyone, old and young alike. 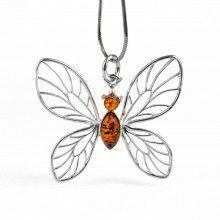 Each piece of our jewelry is handcrafted and each amber stone has its own uniqueness, therefore they might slightly differ from the photograph.